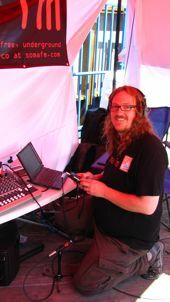 In addition to being the music director for Groove Salad, I am the founder of SomaFM. I program music for several SomaFM channels, including Secret Agent, Drone Zone, Space Station Soma and Digitalis. I've been been collecting records since the mid '70s, And I remember buying my first ambient record - Eno's Music for Airports - right around 1979. I latched onto electronic ambient music right away when the movement started taking off in the early '90s. Many of the records in my collection are now out of print and extremely hard to find, so I hope you don't get too annoyed that you can't easily find them online. In general, I tend to like music that leans toward mellow styles, but I do like my music to have a groove (or have no beat at all).